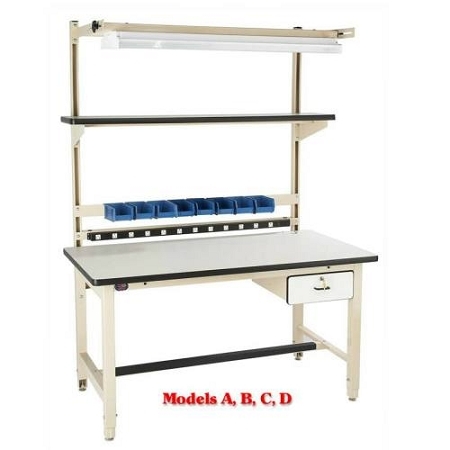 The Model D BIB4 Bench-In-A-Box is a standard Heavy-Duty Workbench. The BIB4 Bench top is a 72"L x 30"W x 30"-36"H ESD Plastic Laminate Bench Top. The four bench legs have a height adjustment of 6". The Model D Frame is painted Light Beige in color. *NOTE: All bench in a box series ESD benches include the grounding Kit.